Bean there: Rajma in J&amp;amp;K is different from the Punjabi version. One of the few compensations for the long, arduous and boring road journeys that the Reshii family undertakes on its annual migration from Delhi to Kashmir is the eating places en route. Absolutely none of them, let it be said, fall into the category of fine-dining or five-star pampering. Yet every year, by common consensus, we stop at the same highway eateries and eat exactly the same dishes we’ve always had. 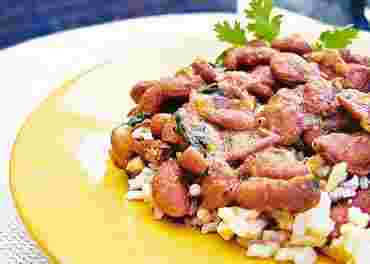 Bean there: Rajma in J&amp;K is different from the Punjabi version. First outside Delhi is Rajpura, where Eagle Hotel serves an outstanding dal makhni. Eagle was probably a mud dhaba (eatery) in a previous avatar. It’s my belief that it upgraded itself to its present banquet hall status (the highest you can get on this particular route) by virtue of its dal. It’s cooked long and slow; Eagle doesn’t muck around with tomatoes, the way Delhi restaurants do. Each grain of dal plops against your palate with the softest, most liquid crunch, broken only by the flavour of ghee so pure you just know it’s a local farm product. We tend not to stop at Panipat, way before Rajpura, because of many unsuccessful attempts to find the original Pachranga achar. This pickle, Panipat’s chief claim to culinary fame, is made of five vegetables and is bottled or canned by every second shop in the little town. I had been told that the original inventor had a product that was way better than the competition, but all our efforts to locate it (at around 10pm, when we usually pass Panipat) have ended in disappointment. Early morning tea is at Lakhanpur, only because that unlovely town is the gateway to the state of Jammu and Kashmir and authorities tend to check permits and luggage with unholy zeal, while lines of vehicles switch off their engines in resignation, to the delight of an army of tea-sellers. The Jammu-Srinagar stretch is a real treasure trove for good eating. One of the dhabas in Peerah has a fabulous reputation for the best rajma chawal (red kidney beans and rice) on the route. Regular travellers time their lunch halt there. Prem di Hatti in Kud sells the most delicious, buttery, ghee-soaked patisa in the state. The little hill town is cool even in the heat of summer, and first-timers can be seen blundering down the road, trying to figure out which is the original sweet shop among the plethora of pretenders. Closer to Srinagar, but still in the Jammu province, is Narsu Nallah. Two tumbledown huts with a slushy courtyard, it’s the very first place on the route to serve noon chai (Kashmiri salted tea) and has the only maize flour rotis on the entire route. Once we cross the Banihal tunnel, the race is on to reach home as fast as possible, so there are no stops. For sheer consistency year after year, these modest roadside eateries get my vote. This is an approximation of the way the dhaba at Peerah would make rajma, which differs from the Punjabi way. No tomatoes are used in Jammu and Kashmir, while in Punjab they would not be left out. Since this is a dal, no garam masalas are used, except badi elaichi (black cardamom). Wash the red kidney beans. Soak overnight so that they are easier to boil. The Jammu region has a wide variety of rajma beans: the dhaba at Peerah uses the smallest ones. Pressure-cook in plenty of water, with salt and the black cardamom, till the beans are done. In a small wok, add oil and fry the onion till light brown, then add the turmeric, fennel powder and, lastly, the chilli powder, taking care that the spices do not burn. Pour them into the pressure cooker, stir well and let it simmer with the lid off till the gravy has acquired the desired thickness and any excess water has evaporated. Lastly, heat the ghee and pour on top so that the beans become infused with the fragrance.